Easter is upon us too soon, and while most of us are looking forward to having some time off work to spend with loved ones and indulge in lots of chocolate eggs and bunnies, you should be sure to keep your pets in your thoughts during these celebrations. 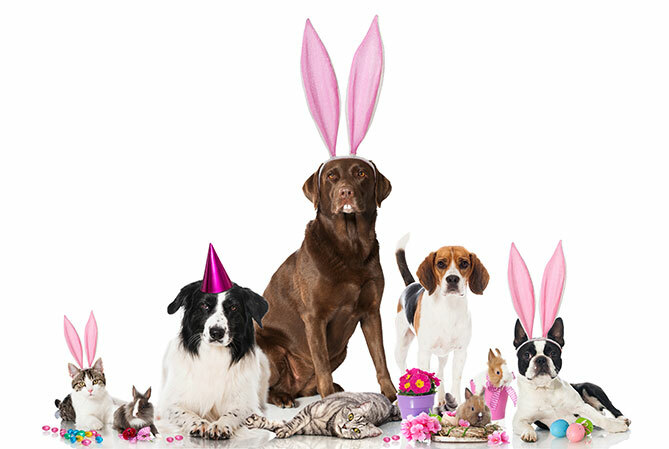 A lot of the goodies we enjoy at Easter can actually be dangerous for cats and dogs to consume, but before you panic and ban the kids’ Easter egg hunt, here’s how you can ensure a safe and fun Easter for both you and your pets. Most of us love to decorate our homes for Easter. Whether that’s with chocolate bunnies and eggs, fresh flowers and plants, or specially crafted decorations, we all know the saying ‘curiosity killed the cat’, and we know that dogs can be just as curious sometimes. Traditional Easter flowers – like lilies – are poisonous for canines and felines. If you share your home with pets, it’s probably best to keep these particular flowers at the florist. If ingested they can cause a loss of appetite, vomiting, lethargy, and even lead to kidney failure in some kitties if left untreated. Your cat doesn’t even have to eat the lily to be affected, it could occur by simply grooming lily pollen off their fur or paws. If you can’t imagine going through Easter without lilies, there are some wonderful artificial lilies for sale that are almost indistinguishable from the real thing. If you’re planning to use tiny toys like flowers, chicks, and bunnies to decorate Easter bonnets and baskets, don’t forget that they’re not only a choking hazard for small children but could also cause issues if swallowed by cats and dogs. Always keep Easter baskets and bonnets off the ground and keep your pets in another room while the baskets are being unwrapped or bonnets tried on. Products like shiny tinsel grass can also be dangerous if ingested by your pets, so if you do want to add grass to your festive scene, try to choose paper or even real grass instead. If you love to decorate your home with balloons, try to dispose of them as soon as they begin to deflate to avoid any unpleasant surprises. While the only danger of gorging on chocolate for us and our children is being sick or developing a nasty stomach ache, these goodies can be extremely dangerous for cats, dogs, and other small animals. Keep your chocolate and other lollies out of reach, and don’t be tempted to treat your beloved dog or cat to a little taste of Easter. Sweet and sugary foods can cause diabetes in both animals as well as humans, and sugar-free sweets containing xylitol can also cause your dog’s blood sugar to drop rapidly. If you absolutely must treat your pets on the special occasion, buy them special cat or dog “chocolates” instead. It’s important to also not forget that the wrappers Easter eggs and other lollies come in can also cause damage if eaten by pets. You know how excited your dog gets when they find wrappers, even when they find them in the rubbish! Hiding Easter eggs around the garden is a longstanding tradition and can be lots of fun for both the kids and grown ups. While it can also be fun for your dog to help sniff out the booty, it won’t be fun if they help themselves to the treats. Many dogs won’t stop to think whether the egg is made of plastic or chocolate and just gulp them down; and even hard boiled eggs can upset their stomachs if they find them several days down the line when they’re less than fresh. If you plan to hold an Easter egg hunt, make sure you know exactly how many eggs have been hidden and how many were found. If you’re planning a party at your house this Easter, a little forethought will go a long way to stop problems in their tracks before they start. Take your dog for a walk beforehand and let them have a good run around. If they’re well exercised and tired, they’ll be less likely to be overexcitable when guests turn up. It’s always wise to have your vet’s information on hand, but at Easter it might be likely that your local surgery is closed. Check your vet’s emergency cover service, and if necessary, keep a note of which vets are providing cover over the Easter period. If this all sounds like your poor pets are going to be missing out on all the fun this Easter, why not put aside some time to take your dogs out for an extra-special Easter walk? They’ll appreciate the exercise and you’ll burn off some of those extra calories you’ll have consumed by eating all those Easter goodies. It’s a win-win!